"Millions of people will die in the war, Ellie. And it's our job to make sure it happens. That's why our work isn't easy." It's been two years since Ellie last spoke to Edward. She thinks she's left the spirit world behind. But the spirits won't take no for an answer... When Ellie's Mum returns to Inchwood Manor, Ellie finds herself going too... and is transported back to the 1930s, discovering a plot to impersonate the King of England. High Spirits sees the series come of age and picks up with the central character, Ellie in her teenage years as she begins to realise the true nature of her abilities as one who talks to ghosts - and to discover her destiny. It sees her time-travel to the 1930s, as she discovers evil spirits and Nazi sympathisers working together in a way that will change the course of history. She then discovers the impact that such a change would have. It's a compelling ghostly thriller, which also allows some parallels to be drawn with the present day. It builds the ongoing story arc to a climax, which will be resolved in the fifth and final book of the series. 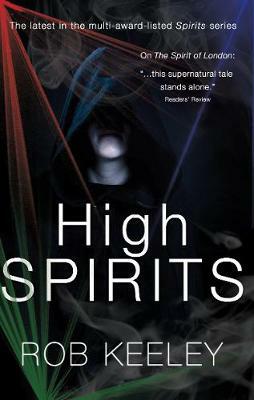 High Spirits works both as a stand-alone novel and as one of a series. It will appeal to girls and boys of upper primary and lower secondary age - and to parents and teachers reading the book aloud. Rob Keeley's books for children have been listed for the International Rubery Book Award and the Bath Children's Novel Award. High Spirits is the fourth in his Spirits series for the 8-12s. He has also written for Chain Gang and Newsjack for BBC Radio and for a variety of publications.